​With its athletic contours and elongated silhouette, the BMW M4 Convertible demonstrates its concentrated power. And provides a taste of what the driver can expect: pure, unadulterated adrenaline. With BMW Business Navigation as standard. At the core of the BMW M4 Convertible is the redeveloped M TwinPower Turbo straight six-cylinder petrol engine. With tremendous power and an unmistakeable sound, the interplay of optimally aligned motorsport technologies allows for direct power development with a boost of 431hp. When the BMW M4 Convertible accelerates to the limit in next to no time, the significance of power can be experienced with all senses. 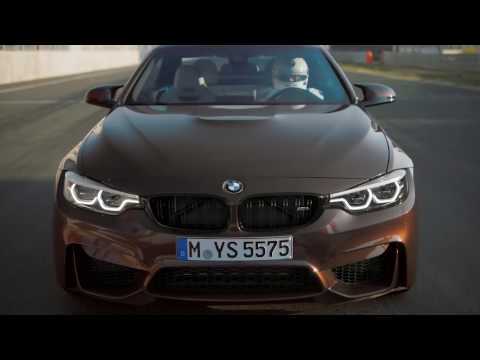 The boost stays finely adjustable even in the highest rev ranges and thanks to numerous motorsport technologies such as the Active M Differential or M Servotronic, the BMW M4 Convertible reacts in every situation exactly as you’d expect of a top-class athlete: with high precision and absolute technical perfection. M Power World is every bit as unique as the BMW M themselves. It is where BMW M fans can obtain exclusive information on the high-performance sports cars by BMW. The air collar ensures comfort when driving by providing warmth for the head and shoulders. When the roof is open, the warming system integrated into the front seats regulates the temperature and amount of air based on the speed and outside climate. This allows passengers to enjoy riding in the convertible even when speeding up or as the weather gets cooler. Take the wheel of the outstanding BMW M4 Convertible and experience it for yourself. With over 100-years of refining, every BMW model has been crafted to deliver pure driving pleasure. There has never been a more exciting time to drive the open road.